Has this ever happened to you? You’ve perfectly planned out your afternoon to finish several pressing tasks. As you sit down to work, you’re feeling extremely proud of your time management skills. Nothing is going to stop you today! Then, you actually try to begin your work and you can’t find that one form, spreadsheet or piece of paper you need to get started. Pretty soon you’re spending your afternoon tearing your desk and filing cabinet apart instead of working. Time management and organization go hand in hand. If you want to get your work done as efficiently as possible, you have to be able to find it quickly. That’s not to say that in order to be organized you must maintain a perfectly manicured filing system. Everyone’s system will look different and the most important thing is that it works for you. This year, I started teaching at 3 different schools during the week and I quickly discovered that my old system of organization was no longer going to work. It was difficult to predict which piece of paper I’d need at which school. I’d find myself wasting an afternoon at one school because I’d left my work at the previous school. I decided the only way to combat this problem was to have a mobile filing cabinet. I bought a rolling cart and put three large files in it- one for each school. Whenever I received an important piece of paper, I’d put it in the rolling cart. I periodically clean out the files and put them in my desk at their corresponding school. My poor rolling cart ended up being a little cluttered, but this system works for me and I rarely have trouble finding what I need. Often, the papers that cause clutter are not the important ones, they are the ones you’ve already used and don’t need anymore. Frequently go through your papers and throw out things you don’t need. 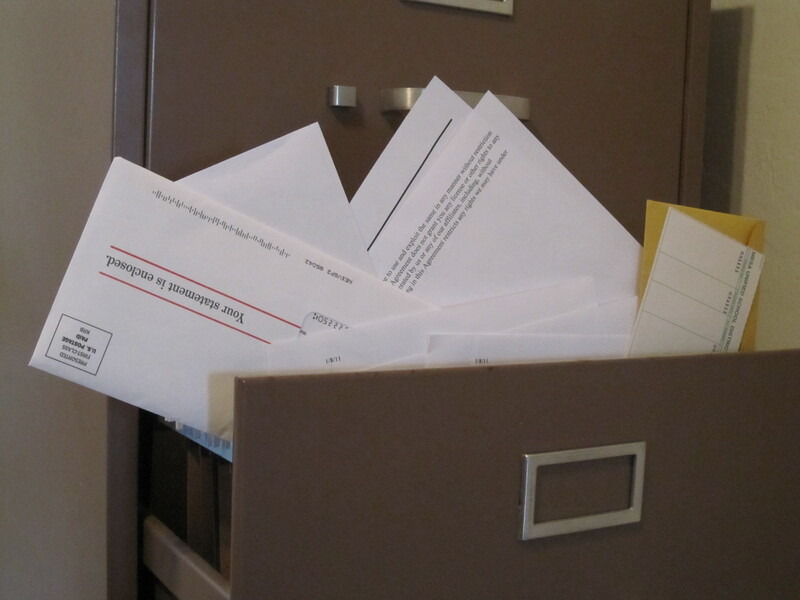 If you can’t force yourself to maintain a filing cabinet, then don’t use one as your primary system of organization. Instead, use bins, trays, notebooks, or whatever else works for you. Filing cabinets that aren’t used properly can become the worst black holes for lost things. If that isn’t your style, use something else. If you use something everyday, there is no sense in keeping it in a notebook on the other side of the room. I keep my most-used contact sheets pinned to my wall by my phone. Save yourself time by keeping the things you use most frequently in a place that is easily accessible. Your system of organization is most important during your busy times, but it needs to be in place before then. It’s too late to build a life boat when the ship is already sinking. Use a less-stressful time to re-vamp your organization so you’ll be prepared when your hectic time hits. Emily, thank you so much for this awesome blog. I really need to work on my organization. You’re absolutely right, it is tough to manage time when you are not organized. Only if I can find someone to help me organize my stuff… hahaha.